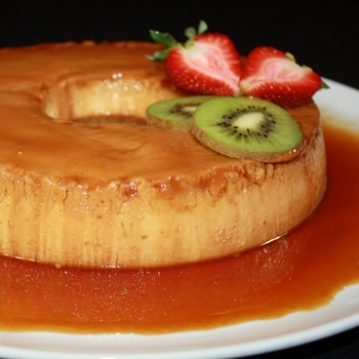 This delicious dessert is similar to a custard, but with more consistency and creaminess. It’s presence is almost mandatory in all Venezuelan birthday parties. It can be served with fresh fruit or with a sauce of strawberries or raspberries, making it an elegant dessert for any dinner or lunch. 1. Place a small saucepan over low heat, dissolves sugar stirring occasionally until syrup begins to turn golden and then becomes deep golden. Coat the walls and the center of the tube pan. Allow to cool. 1. Place a container with enough boiling water in the oven to cover 3/4 of the tube pan. 2. Process half of the ingredients in a blender, pour into caramelized pan. Blend the other half and add to the pan. Cover and seal the edges with foil. Bake in a water bath for 55 minutes. Remove from oven, uncover the pan and let cool on a rack. 3. Refrigerate with pan until the next day. Remove from the refrigerator, gently rotate the pan in order to lift off the quesillo. Flip over on a tray. Keep in the refrigerator until ready to serve. For raspberry sauce recipe go to www. chefmariaamado.com in Postres y reposteria under Quesillo Venezolano.